BENIN—Some youths and mobile policemen, yesterday, clashed in Benin, Edo State capital, over the killing of a man over N100 demanded by policemen at Upper Igun area. It was gathered that the unidentified commercial cab driver was with his wife and two children in the car, when the Police operatives allegedly demanded N100 from him, which resulted in an altercation between the two parties. Sources said the officers shoved the driver, who fell and his head was crushed by a petrol tanker, spilling his brain on the road. Following the driver’s death, irate youths and drivers mobilised and descended on the Police operatives, who abandoned their operational vehicle and fled. One of the policemen was, however, not so lucky, as he was said to have been attacked and pushed into a drainage. The city was subsequently locked down by protesters as the ever busy Akpakpava Road and all other adjoining roads and link roads were blocked with bonfires made by the angry protesters. At press time, unconfirmed sources had it that one of the policemen was killed and about four Toyota hilux vans belonging to the Police set ablaze by the enraged protesters. The vehicle of the victim, a black BMW with number plates AFZ 846 HW, and the petrol tanker marked FKJ 567 XB, were parked at the scene of the incident. In his reaction, Edo State Police Commissioner, Mr. Babatunde Kokumo, said: “At about 8a.m. this morning, there was a fatal motor accident and it was alleged that a Police patrol team caused the accident. We are going to investigate. “But the restive youths took to the streets to protest the killing of the driver by an articulated vehicle that was coming from behind. It was the fatal motor accident that led to the protest by the restive youths. “We are doing our best to ensure that we restore normalcy. I have equally ordered the arrest of the policemen alleged to be involved; a full-scale investigation will be carried out. The state governor, Godwin Obaseki, in his reaction, called for calm over the clash between some youths and mobile policemen over the killing. Obaseki condemned the fact that the incident degenerated into civil disturbance, noting that there were better ways to resolve the matter. 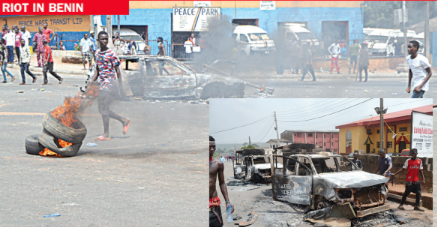 The post Riots ground Benin as policeman kills driver over N100 appeared first on Vanguard News.